No, I’m not technically single. But Nick has been gone for over a week, so it’s kinda like being single. It seems like when Nick is home, there’s all kinds of things I want to try that he’s just not that into. But as soon as he left, I couldn’t think of a single one. I think the truth is that both of our tastes are evolving to be a bit more similar. I’ll have to see what he thinks about that. I was also sick for part of the week, and then the kid was sick for part of the week, so big to-do dinners just weren’t in the cards. This recipe was perfect because it was simple, relatively quick, and super easy to clean up after. Preheat oven to 400F. Line a rimmed baking sheet with foil, and spray or brush with olive oil. 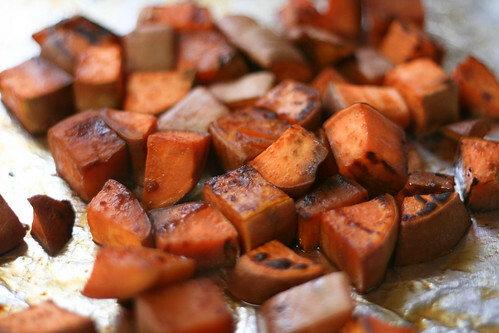 Spread the sweet potato out on the baking sheet, then bake for 10 minutes. 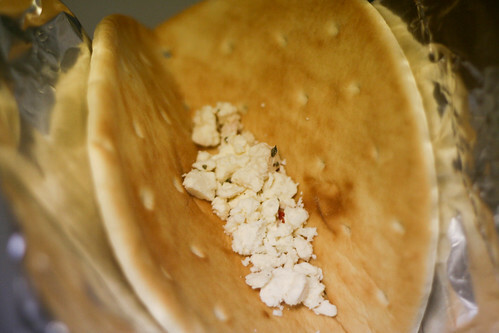 After the ten minutes, add a little bit of hot water to the baking sheet and return it to the oven. Not so much water that the potato is drowning, but enough to give it a nice steam. 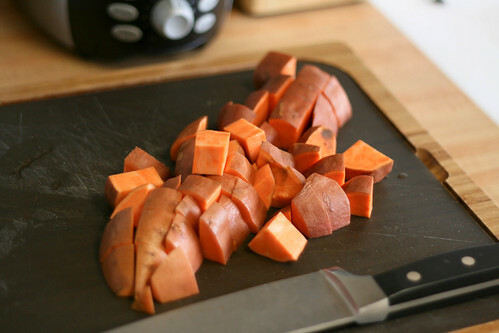 Repeat this process one or two more times, until the sweet potato is very tender. 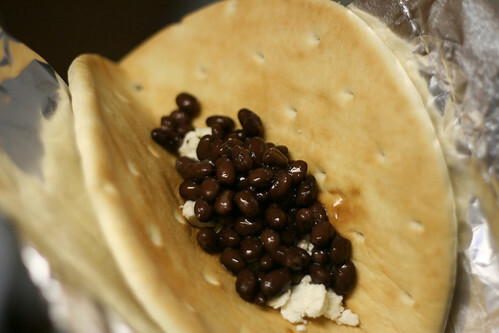 Warm up the black beans, and then the flat bread. 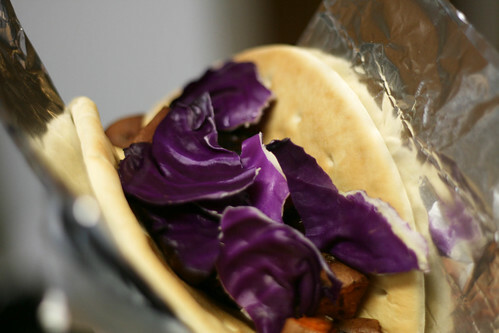 Combine all the ingredients and wrap in foil. This is probably one of those meals that Nick wouldn’t be wild about, but I guess I’ll have to make it again this week to find out. This is exactly the sort of thing I make when Mr.B isn’t around. 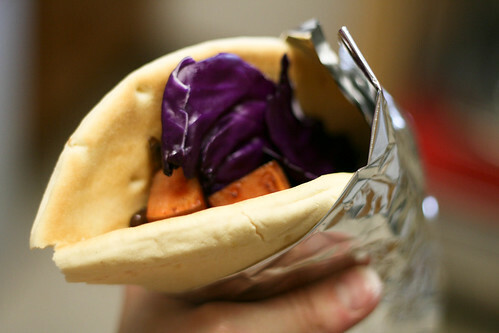 I love making pita wraps with roasted vegetables, but he will pick at it sadly if there’s no meat. Men can be such carnivores. 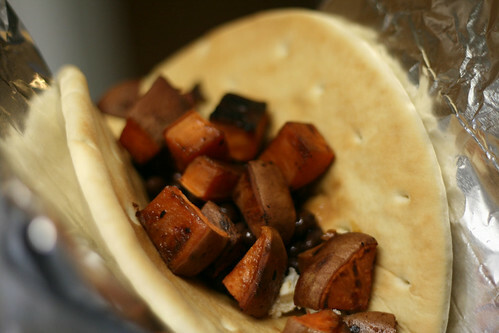 I’ve found that tossing sweet potatoes with a mix of soy and honey makes it unnecessary to add water; the coating sort of makes a shell that keeps the potatoes from dehydrating. When I make this again, I’m definitely giving that a try. Jo, you know I love you for making a sandwich/flatbread. This looks so so good. Make it for me?